I am here today to present myself and seek some advices. I am a french business man, Porsche Guy and more generaly I adore the automotive world. I like cars in general and all the ingeneering that goes behind. I go every year to the 24h of Lemans and have not missed a Le Mans Classic yet. Well, I love cars, not for the image they send, but for the history behind them. I am writing here today because I am facing a "problem". I own a 997 GT3 3.6 that I love. But I hurt severely my left harm. 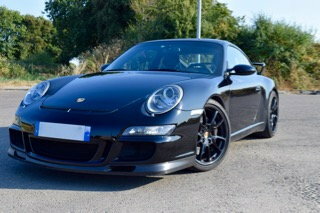 There fore I cannot drive anymore my GT3 (at least for 8-10 months). I want to have a gt car that I will be able to drive. In my choices I only kept the DB9 (post 2008) and the Continental GT SPEED mk1 610. I am looking for something reliable, that will be easy to drive nd use by any weather, or conditions. I want something whose sound will be gracious, refined, but powerful. It won't be my daily driver's car. Why would you pick and why? Please Specify "weather" for us. If you see snow, the AM is not the best choice. The Bentley will be for sure. IF not then either. I have driven both a good bit. The Bentley will be more spacious and allow for 4 people to ride in it in somewhat relative comfort. The DB9, only 2 unless the rear passengers are amputees, then they would be fine. Reliability probably about the same either way. Both expensive to maintain, and both are GT cars. However, the DB9 will hug you more and tighten up the interior, so wont feel as roomy. All depends if you prefer more sporty (AM) or more comfy (Bentley). Unless you move towards something like the GT Speed, where the ride will tighten up. The DB9's sound thought is unmatched, unless you have a F car or Maserati. The noise the DB9 makes is unbelievable. The Bentley is cool but much more mild mannered. If the weather isn't too severe I say go for the DB9. Mine was very reliable for the 3 years I had it. TO be honest the DB9 shape appears more appealing to me. But the 4 places of the CGT and its four wheel drive system are very attractive! !